Media.net Native advertising network details. Media.net is one of the biggest leaders in the advertising industry offering a large range of ads: search, native, display, mobile, local, products, and video. Media.net handles ad supplies for over 500k websites and their products portfolio is one of the largest in the industry. 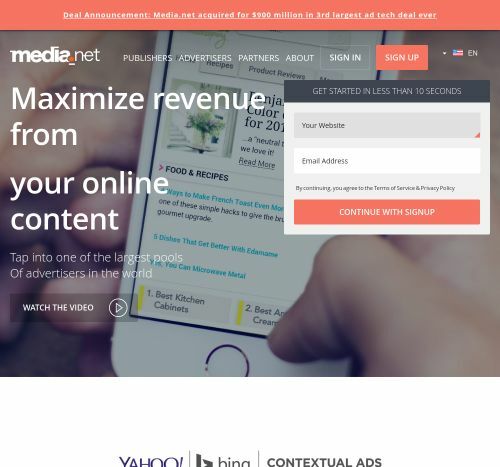 Media.net increases ROI and revenue with their online advertising offer and targeting multiple segments. They create display-to-search ad formats and provide innovative methods to monetize display placements. For additional information before registering on the Media.net platform, see the Information section to find out what Pricing Models they offer, which are their Targeting Options and Advertising Formats.